Eco and green are the words to live by if we must sustain humanity. At least that is what many experts now believe. 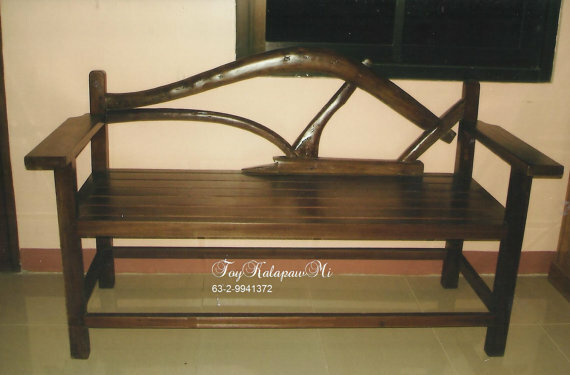 One simple but amazing way to upcycle vintage furniture that has been practiced by this resilient ethnic group in the Philippines is to use old, salvaged wood from torn down homes that are decades old. A wisdom gained from their ancestors who knew which type of wood they would use for certain purposes - like a staircase, or door and window frames. These are the woods used at ToyKalapawMi furniture. For instance, one of the unique products they have is a bench (above) with arado or soil tiller as backrest? And the rest are also made of salvaged old wood, not only to lend but provide an authentic green furniture for Philippine residents. They deliver at most parts of Luzon with minimal fees.